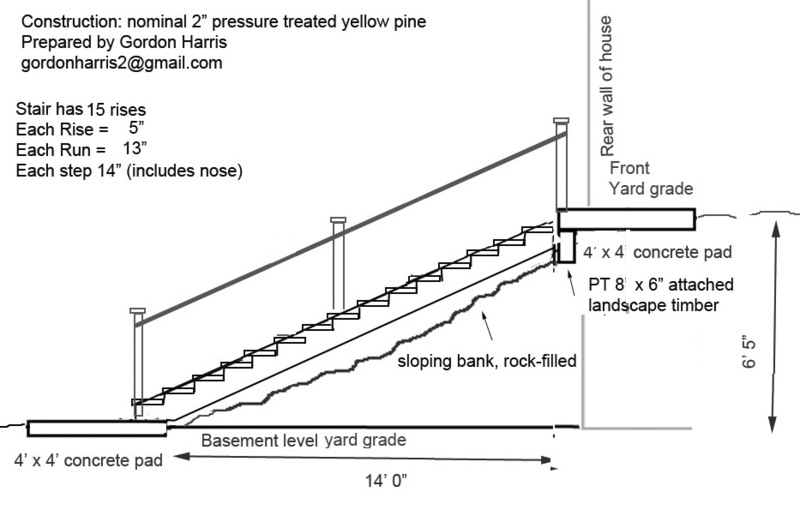 I built this set of landscape stairs to provide access from the driveway to a finished basement. The steep bank had been filled with boulders and topped with large stones. The photo above is the finished project. 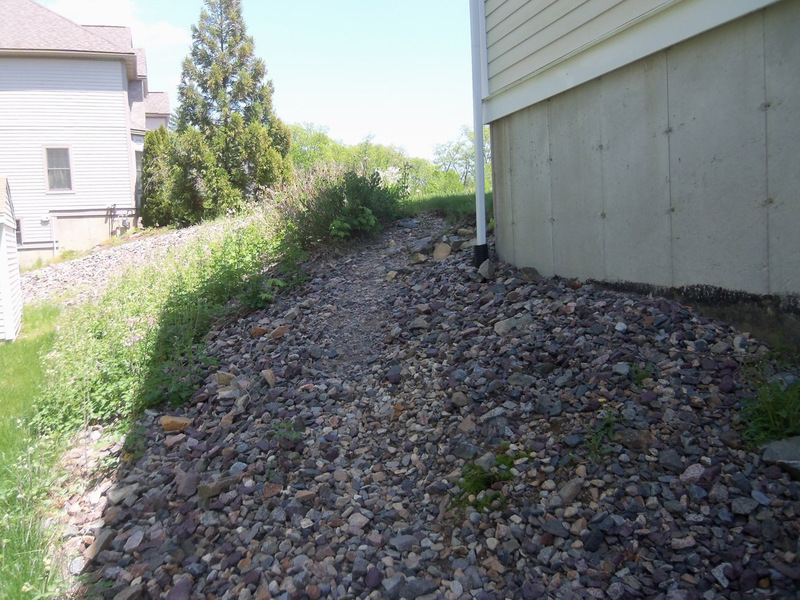 In the photo below you can see the dangerous rocky temporary path that the owners had been using. Design and permitting took about a day; digging holes (and removing a lot of big rocks) for the concrete platforms and supporting Sonotubes took another day. The carpentry work was three days. To calculate the layout of stairs, you must determine the total rise and run. The sum of the run and rise of each step should be between 17 and 18″. These stairs have a very generous run and easy rise because of the slope of the bank. The four stringers are 16″ long. We poured concrete pads for the upper and lower landings, supported by Sonotubes, which will help prevent shifting and erosion. 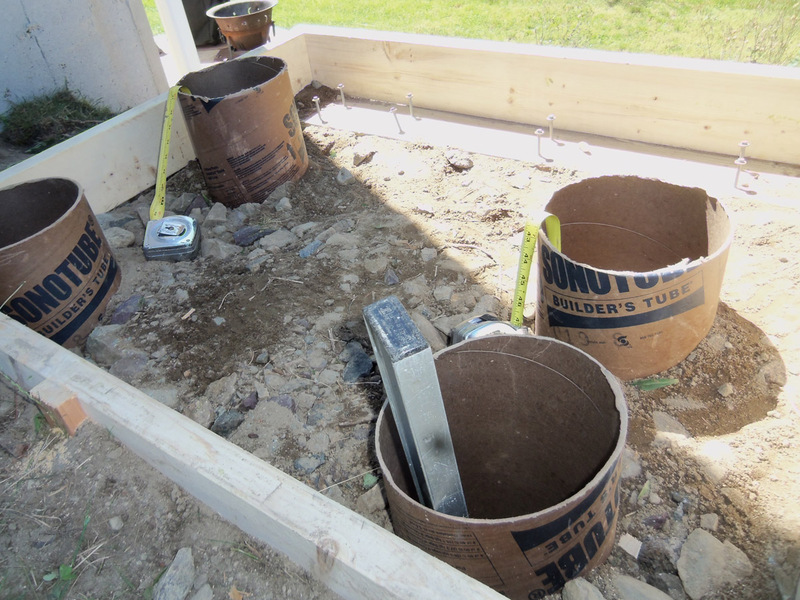 We trimmed the tubes and laid in rebar before pouring the concrete. Before pouring the concrete, we set a pressure treated beam under the leading edge of the upper pad. We screwed 6″ bolts halfway into the beam so that the heads and shanks are embedded in the concrete. 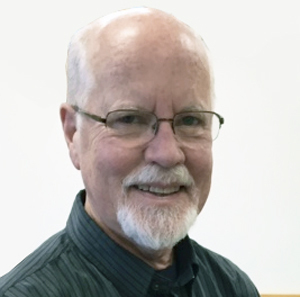 A 2″x12″ pressure treated board was then attached to the beam. 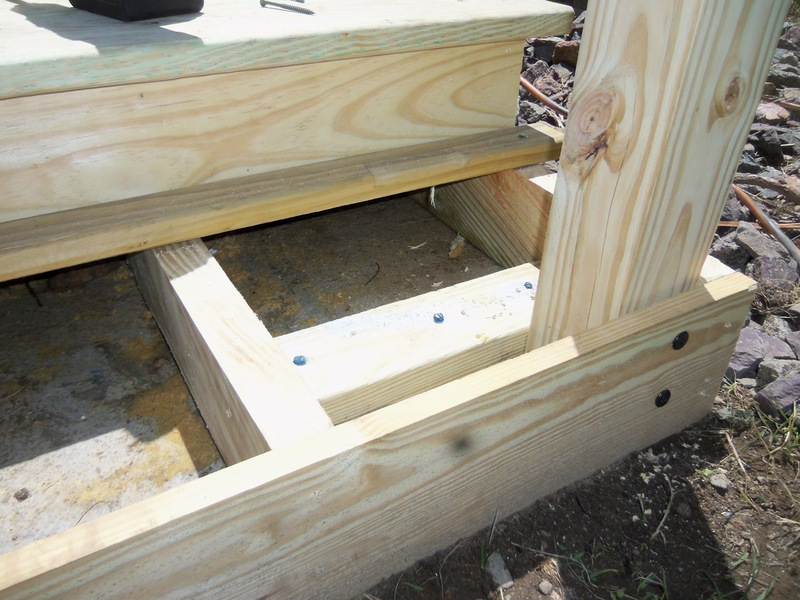 The stair stringers are attached to the board with screws and joist hangers. 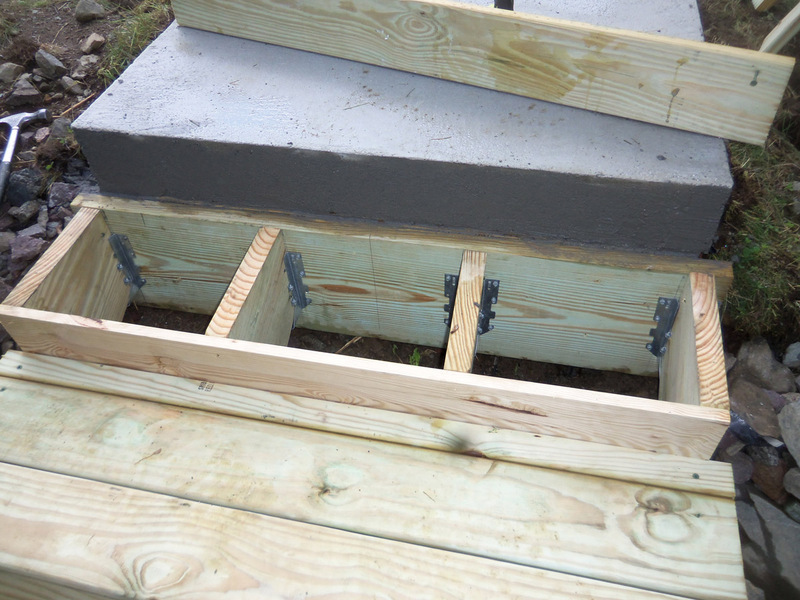 Shown above is the upper concrete landing, the first step down with the joist hangers exposed, and the second step down with treads installed. 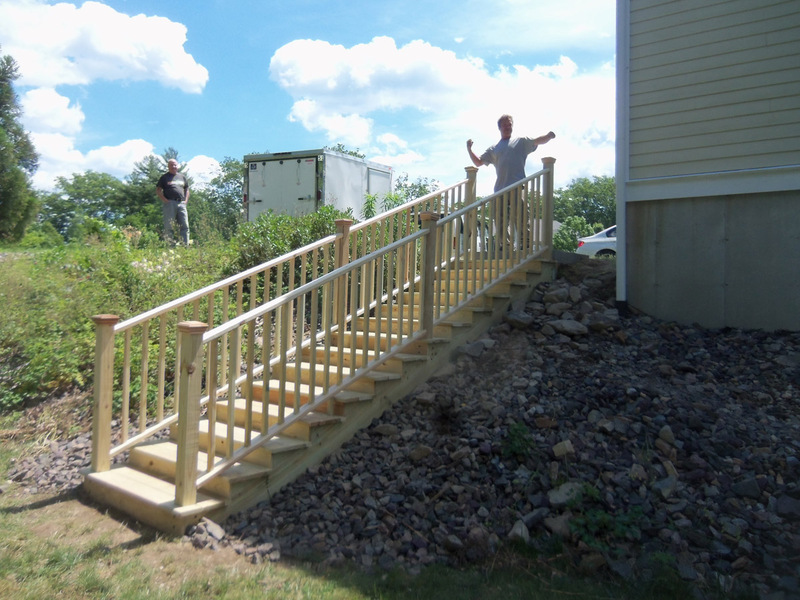 Each step has a shallow 5″ rise and a generous 13″ run. The 1″ overhang makes it 14″. Thanks to Tim Gillette for his help on this job. We got it done in 5 days, and that included moving a lot of big rocks! The owner will stain the new stairs after giving the pressure-treated wood time to completely dry.